Porty Hostel i Port Antonio, Jamaica: Bestill nå! The following group types are not accepted by this hostel: Junior / Primary School, High / Secondary School, College / University If you have misrepresented the type of group you are booking for, your booking may be cancelled by the hostel." 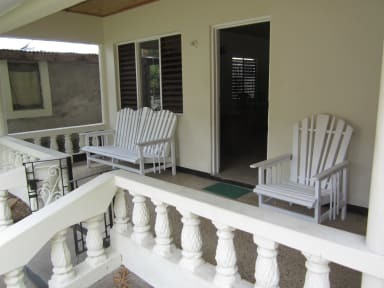 Porty Hostel is located in Prospect, the residential neighborhood of Port Antonio, and it's close to the most beautiful beaches of Portland Parish. The common areas of Porty Hostel are formed by a large lounge and dining room (with a computer and internet connection WiFi), a spacious and practical kitchen equipped with all the pots and dishes and two outdoor spaces for moments of relaxation, all at the disposal of guests 24 hours 24. In the morning, if you want, we will serve to you a delicious Euro, US or Jam breakfast, as well lunch and dinner, booking them. 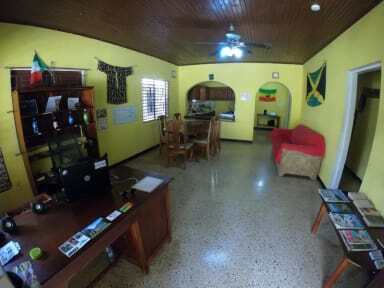 If you want, the owner Stefano will bring you or will indicate the most wonderful beaches with typical Caribbean characters, the city streets for shopping and the wild dance hall and reggae parties in the night. The staff of Porty Hostel can also organize tours to visit the Reach Falls, to do rafting on the Rio Grande or to do hike on the nearby and beautiful Blue Mountains. You can also have a taxi service from/to every part of the island. For the night you can choose from two cute dormitories or a nice and private double room. The dormitories are furnished with bunk beds, one fan, a locker and a wall closet. The double room has a private external bathroom, furnished with a queen size bed with a headboard / bedside table, a table dress with mirror, a wall closet and a fan, perfect for couples or those who simply wish to have their moments of privacy. You will feel at home in Jamaica! Check out time (from the room) 13:00. *Cancellation policy: 1 week before arrival. *Payment upon arrival by cash. *Breakfast not included - 2.60 USD per person per day. *The bar/ reception is open from 9:00am to 12:00am. *The check in is possible out of these hours if communicated at least 48 hours before.